There are many reasons why you may want to start a blog on WordPress, your passionate about something and want to tell the world? your on a personal journey? your a traveler and want a travel blog? you know your niche and feel you can help or add value to people? you’ve seen the success of others and think HEY! i want some of that! but seriously, whatever your reason for starting a blog, you will need to know how to start a WordPress blog without making any mistakes from the beginning and give yourself the best possible chance of success. There are plenty of blogging platforms out there, some are paid services but there are also many free options. Platforms such as WordPress.com, Blogger, Medium, Svbtle, Livejournal, Weebly all provide the tools to create a blog, but the best way by far is to setup a self-hosted WordPress Blog. Having a self-hosted blog built with WordPress will give you full control over the overall design and styling, adding themes, theme development and customisations, additional functionality, plugins, seo (search engine optimisation) friendly site structure and so much more. In this post we will show you how to setup a wordpress blog, we’ll go through, Domain Names, Web Hosting, WordPress Installation, Themes, Plugins and some SEO techniques which will ensure your Blog is setup is setup correctly, with basic optimisation, giving you the best foundation for a successful blog. Ok, before we carry on it’s probably best to answer a question we get asked a lot! What’s the difference between WordPress.com and WordPress.org. The WordPress platform basically comes in two flavours, WordPress.com and WordPress.org. WordPress.com is a fully managed solution which requires you to sign up for a plan on the Wordpress.com website. WordPress will take care of the domain, web hosting, software updates, backups, and security which seems good but it does have many restrictions. 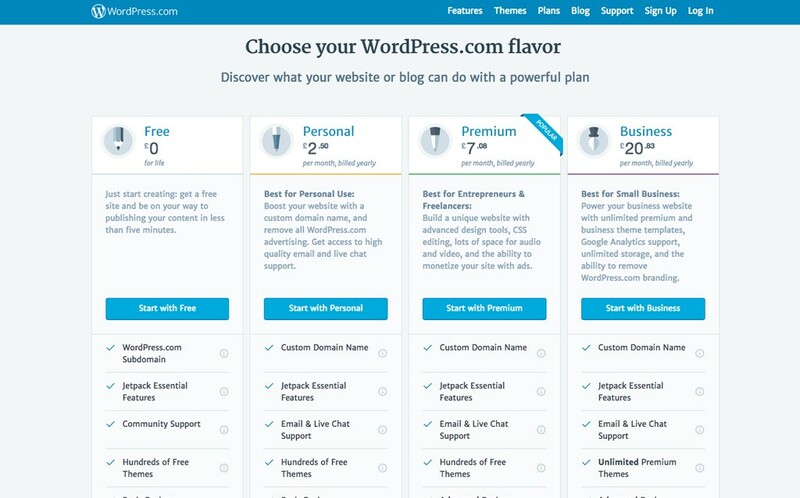 WordPress.com offer four plans, Free, Personal, Premium, Business. 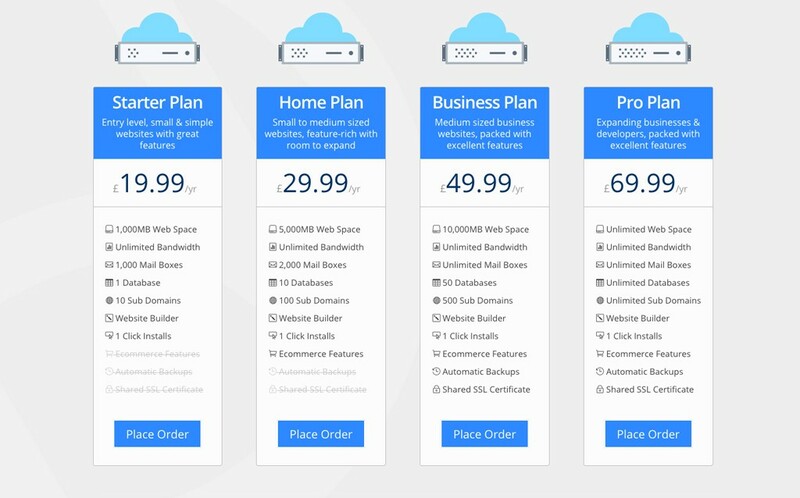 The main downsides are that your website will be hosted on shared platform, they do not allow you to use plugins (because of security risks), you cannot use any themes created outside of WordPress.com and you can only perform basic design customisations (premium/business plans do allow you to perform some advanced customisations). If you want a free WordPress.com website you will also be required to have your website run on a sub domain E.G yourwebsitename.wordpress.com which, in our opinion can look unprofessional if you are creating a branded business site or a personal branded blog. Opting for setting up a blog in WordPress.com website effectively means you are renting their platform, restricted to the features available in the plan you purchase and are required to adhere by their terms of service. 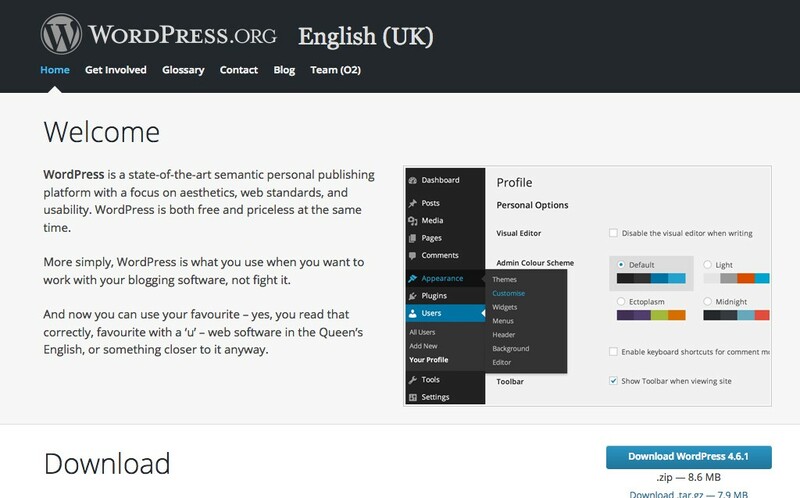 WordPress.org (the version we love and you should too) is a free version of the software which can be downloaded and uploaded to your your own web hosting. You will have complete control of your website, allowing you to develop, design, customise and scale your website to your hearts desire and take advantage of 1000’s of website enhancing plugins and themes that the WordPress thriving community continues to develop. There are plenty of 1 click plugins which can add extra security, so don’t worry too much about that. Also if you find a host which offers Automatic Snapshot Backups then you can always revert to a previous version if anything goes wrong. Getting your self-hosted WordPress site will require some technical knowledge but it’s really easy to get setup and we’ll show you how. To have a blog or website you’ll first need to register a domain name, we can provide you with one here or you can register a domain with any other domain provider. Choose a domain which is easy to type, memorable and try to use either your brand name or keywords which best describe your blog or business. Although keyword rich domains can help with ranking in the search engines, using your brand name as your domain is always better as brand recognition is key for online success. .com: Originally intended for commercial organisations and now open for general usage, now the international standard for TLDs. .net: Generally used for networking technologies, internet service providers, technical and infrastructure websites. .org: Originally for non-profit organisation but now commonly used by schools, communities, projects and also profit organisations. .biz: Business and commerce websites. .me: Personal websites and blogs, portfolio websites and CV’s. There has also been an influx of new generic top level domain such as .guru, .xyz, .photography, .solutions, .today, .technology and many more. 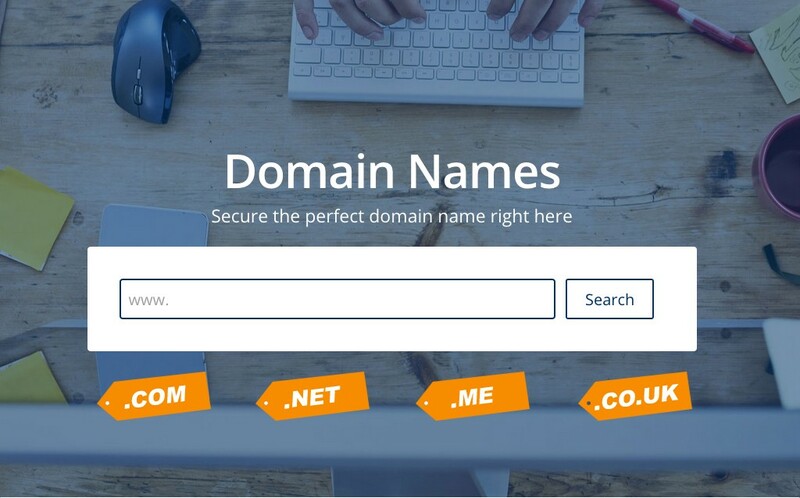 Depending on your audience you may want to opt for a country code second-level domain (ccSLD) such as .co.uk or .me.uk for example. After you have secured your domain name you will need to purchase a web hosting plan to upload your files to. There are plenty of web hosts out there (including us) which offer WordPress web hosting, just be careful as there are a few web hosting requirements you will need in order for your WordPress Blog to function properly. First and foremost you will require a web hosting package which supports PHP, MySQL and the mod_rewrite Apache module. Secondly you will need to determine how much bandwidth, web space, MySQL databases and other things like email mail boxes you will require. WordPress will use 1 MySQL database, the more images, videos and content you have the more web space you will need, but having a hosting plan with 1GB web space is a good place to start. Bandwidth will depend on how many visitors you think you will receive, many web hosts offer unlimited bandwidth but if not make sure you start with around 5-10GB per month which should be enough for a growing blog that does not have lot’s of large media files and does not stream a lot of video. With almost all web hosts you will have the ability to upgrade to accommodate your requirements as and when you need to, just make sure your not paying for a spec you don’t yet require. 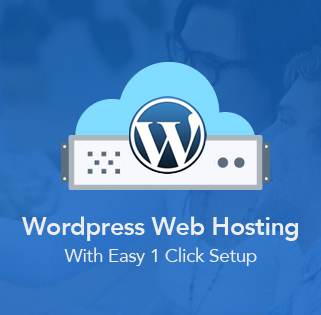 Once you have your domain and web hosting setup, you will now need to download the latest version of WordPress (for English UK version click here) and upload this ZIP file to your web hosting root folder, in most cases this will be the public_html folder. If you do not see a public_html folder are unsure just contact your web host and they will be able to tell you. Once the ZIP file has been uploaded, unzip it and you will see the WordPress core files in the public_html directory. Alternatively you can upload the WordPress files to your root folder using your preferred FTP client. We recommend FileZilla but there are plenty out there which all do a similar job. 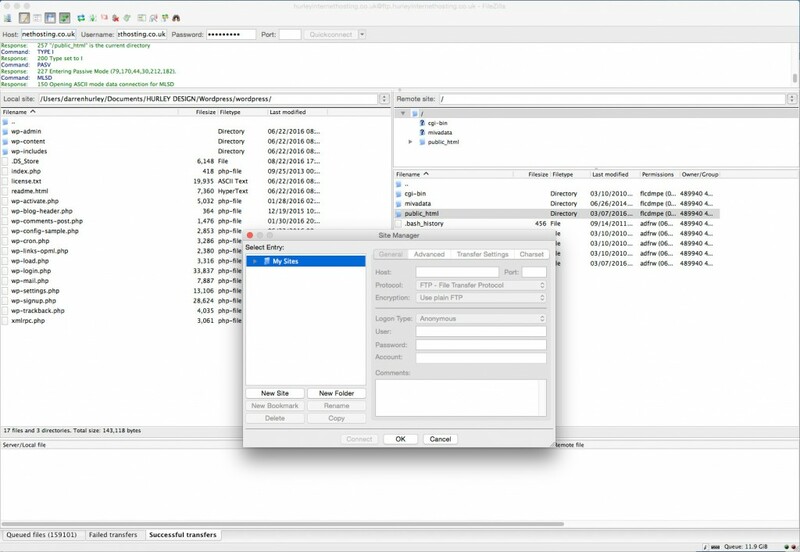 To use FTP you will firstly need to setup a FTP user from your web hosting control panel, then add the user info into your FTP client to connect to your server. You will need to enter your Host (usually something like ftp.yourdomain.co.uk or your server IP address), Port (usually 21), Username and Password which you created from within your web hosting control panel to connect and upload your files. Quite often web hosts will automatically place an index.html file in the public_html directory so check this before you upload and if there is one just delete it. Next you will need to create a MySQL database and user. To setup a new database and user you will need to firstly click on the “MySQL Databases” icon in the web hosting control panel. Enter a username and password and write these down somewhere safe and click on “Create”. If you are using cPanel you will firstly need to create the database and then create the user and assign the user to the database. So now you have your WordPress Website files and your MySQL database ready, we need to get them connected. In the File Manager or FTP client, navigate to your public_html folder and find the file called wp-config-sample.php, open this file and edit these lines of code. If you scroll down a little you will also see “Authentication Unique Keys and Salts” click on this link https://api.wordpress.org/secret-key/1.1/salt/ and copy and replace the code below with the code in the newly opened browser window. 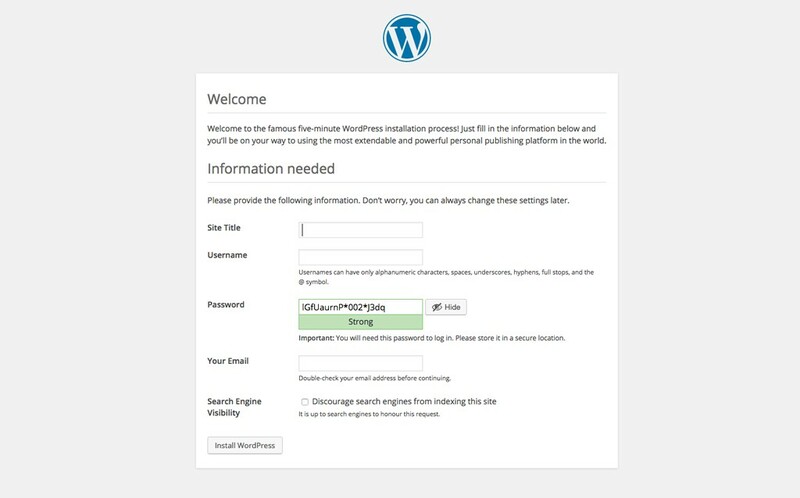 [TOP TIP] This whole part of setting up and installing WordPress can be automated on our web hosting plans, all you need to do is click on the 1click WordPress installer in the web hosting control panel and our systems will install the latest WordPress software for you. Once the installer has installed the files and setup the database you can then enter your domain name into the address bar in your web browser and complete the WordPress configuration in step 4. After you have uploaded your files and setup a MySQL database, you can now visit your domain name url by typing your domain name into the address bar in your web browser. All going well you should have reached the installation page. Here you will need to fill in a quick form, you will need to set the site title, username, password, email and decide if you want to discourage the search engines from visiting you blog straight away. All these settings can be changed later so don’t worry. Just ensure you set a strong username and password. 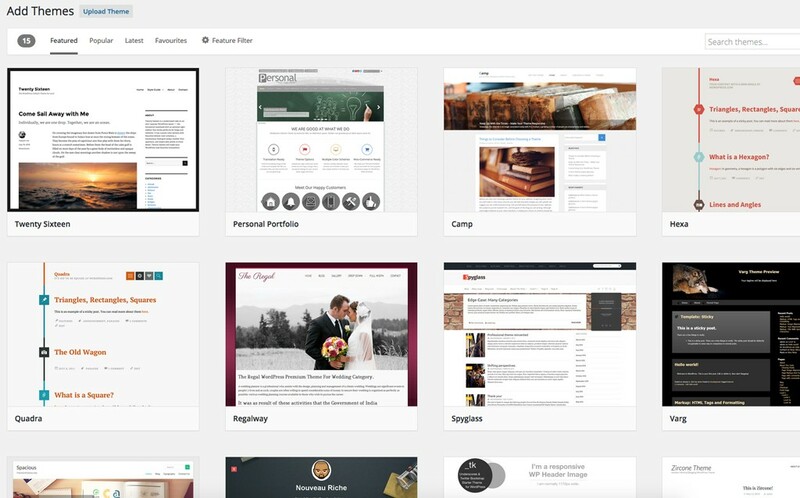 There are thousands of free and commercial (paid for) WordPress Themes and plugins available for you to use on your own website. On the WordPress.org website you can find the latest WordPress themes for almost any niche or business type, you can also checkout the latest featured, popular and beta testing WordPress plugins here. If you cant find what you are looking for there, you can also find lot’s of amazing premium themes at ThemeForest or Template Monster. To upload a theme you will need to navigate to Appearance > Themes in the WordPress admin area, click add new and activate of the themes from the theme list. Alternatively you can click on Theme Upload and upload a theme ZIP file, from an outside source like ThemeForest for example. Once successfully uploaded you will need to activate the theme. To add a new Plugin you will need to follow a similar process, navigate to Plugins > Add New, and install the plugin you require from the list. Alternatively you can click on Upload Plugin and upload a plugin ZIP file from an outside source. Once uploaded you will need to activate the plugin. If you are a budding designer you may want to take a look at our blog post on starter themes for designers. The First thing you will need to do is ensure your site is not getting blocked from the search engines, navigate to Setting > Reading (which can be found in the left navigation panel from within the WordPress Admin area), and make sure Search Engine Visibility – Discourage search engines from indexing this site is NOT selected. Secondly, you will need to create a custom URL structure. Navigate to Setting > Permalinks, here you will need to change the Common Setting to Post name. This will allow you to have SEO friendly url’s where you can include your keywords. When creating a new post, WordPress will use the title of your blog post to create the permalink url, but if you want to change this you can click edit next to the url (underneath the post title) and change it from there. There are also plenty of plugins available which can help assist you in creating an SEO friendly blog or website using WordPress. 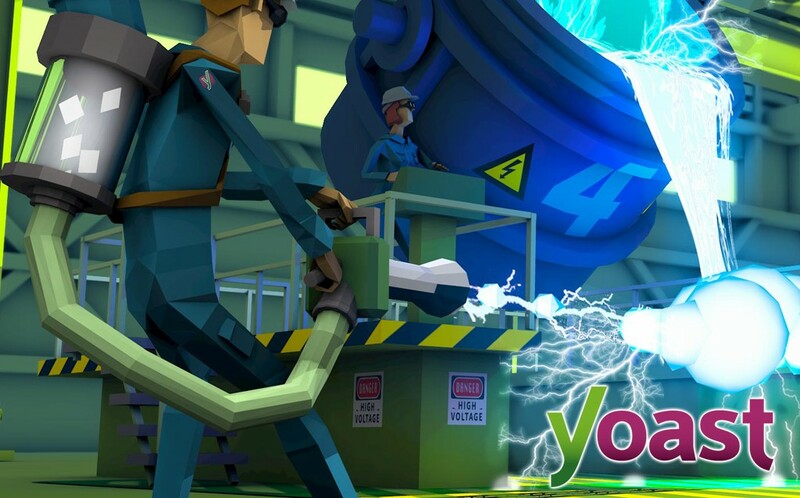 Currently the most comprehensive SEO Plugin is YOAST SEO. It has both free versions and paid versions but the free version will provide everything you need, from meta titles, meta descriptions, keyword focus, in-page analysis, SEO recommendations, xml sitemap generator, meta robots index/noindex features, canonical url and so much more. Another plugin which is widely used is All in One SEO Pack. So your blog is setup and your amazing content is starting to appear the Google search results, now you need to track your visitors, see how they interact with your site, how they got there and how you can improve your visibility. Google gives away lot’s of technical analysis which can be invaluable to the success and future of your site, so here is how you can get this setup on your WordPress blog or website. Firstly you will need to add Google Analytics, visit https://www.google.co.uk/analytics/ and click on Get Started, which currently is about half way down the page. If you already have a Google Account you can sign in, if not you will need to click on Add Account > Create Account and follow the steps to signup. Once signed up you will be redirected to the Setup Page, if not go to https://www.google.co.uk/analytics/ again. From there you will need to provide some information about your website, such as account name, website name, web address, industry, location/time zone then click on Get Tracking ID button. You will now be on the for your property, write down or copy the Tracking Code ID as you will need to add this into your website. A great way to the add Google Analytics Tracking Code into your site is to utilise the Google Analytics by MonsterInsights Plugin, once installed, navigate to Analytics > Settings, then in the general just add your Tracking ID and your good to go, shortly you will see data coming through to your Google Analytics Account. Thanks for reading and we hope this beginners guide on how to make a wordpress blog will help you setup and get started on your blogging journey. If you think others will find this useful please share this post on your favourite social media platforms.